Alexandra residents, unhappy that Mayor Herman Mashaba did not show up, are now calling on President Cyril Ramaphosa to address the community. Marchers start taking to the freeway. #AlexTotalShutdown | Residents are heading back to Alexandra. They are unhappy that Mayor Herman Mashaba sent City Manager, Ndivhoniswa Lukhuwareni. Marchers refuse to be addressed by City Manager Lukhwareni, demands Mashaba to be present. Marchers are still waiting to be addressed by Mashaba. Protesters say that they will not leave unless Herman Mashaba arrives to receive the memorandum. Marchers have now made their way to City of Johannesburg Regional Offices in Sandton. They will deliver their memorandum of demands. The group appears to be small in numbers, they are being escorted by JMPD and police. Police officers have blocked off Katherine Drive, protesters have moved across. Marchers are moving across Grayston Drive bridge. Police officers have confiscated tyres from protesters. Residents of Alexandra have vowed to set tyres and rubble alight in Sandton and other neighbouring suburbs if City of Johannesburg Mayor Herman Mashaba doesn't meet them soon. Speaker after speaker at a community meeting on Friday morning vented their frustration at poor service delivery and slow change. Many people questioned whether the only way to attract Mashaba's attention was by burning tyres in nearby Sandton - one of the country's most affluent suburbs and the financial heartbeat of Africa. The ANC and DA in Gauteng have hit out at each other after tense protests, which is set to intensify, rocked Alexandra. The DA's Gauteng premier candidate, Solly Msimanga, laid a complaint at the Alexandra police station on Sunday. However, the ANC in the provinces labelled it as a "cheap political stunt". The DA in Gauteng claims that the Alexandra protests have been orchestrated by the governing party to influence the upcoming elections. 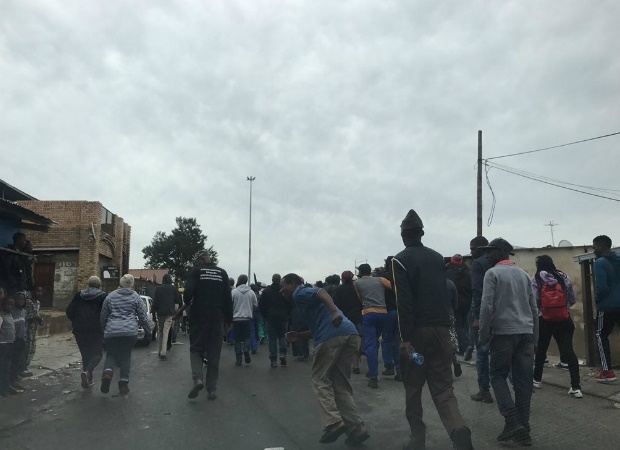 It remains unclear whether protests planned by residents of Alexandra would go ahead on Monday morning as heavy rains continue to pour down in Johannesburg.Last week residents of Alexandra, citing service delivery issues, took to the streets of the township. They called on Johannesburg Mayor Herman Mashaba to address them, News24 reported. News24 reported on Wednesday that angry residents blocked roads leading into the area with rubble, burning tyres and rocks as they led the #AlexShutDown demonstrations.